For permission to use photos of Riley, Team Rainbow Pack or a Rainbow Pack event please contact Info@RainbowPack.org. Click the image to hear the Giving Back Podcast interview with Riley about Rainbow Pack. Click the image above to see the video filmed by KLCS at Vinedale Elementary. Please click on the image above to listen to the podcast done by Crazy Good Turns about Rainbow Pack. A great story about Rainbow Pack that features some of our volunteers,teachers who work at the schools where we give and our founder Riley. On August 24, 2015, fifteen exceptional Jewish teens were honored as recipients of the 2015 Diller Teen Tikkun Olam Awards (http://dillerteenawards.org). Each teen received $36,000 for their outstanding leadership in community service and their commitment to tikkun olam, or "repairing the world." To see the video click on the video above. 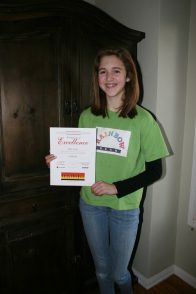 Meet Riley Gantt, yet another brilliant and deserving winner of The Extraordinary Teens contest. Riley is a fourteen-year old from California, who has been running her own organization, Rainbow Pack, since she was only 10. The organization provides backpacks and homework supplies to underprivileged children. To see the PBteeen Blog Post about Riley and Rainbow Pack click the image above. Please click on the photo above to hear the podcast interview with Riley by Generosity Philosophy. Hear all about how we started, why we do what we do and what we have planned for the future. On Friday, August 8, 2014, Councilmember Felipe Fuentes (CD7) recognized Riley Gantt, a 14 year-old, who, three years ago, founded Rainbow Pack, a non-profit organization that has been providing backpacks filled with school supplies to elementary school students in need. The organization has distributed over 2,000 of these backpacks, allowing students to do their homework and do better in school. To see the video click the image above. Joselyn López, 10, chose a pink backpack. Her brother Ivan, 8, a blue one. Inside the backpacks were folders and school supplies. Like these children, all 900 students from first through fifth grade at Haddon Elementary School in Pacoima will arrive next Tuesday Aug. 13, their first day of the 2013- 2014 school year, sporting new backpacks with all the basics— paper, colored pencils, erasers and pencils. "Sometimes one doesn't money to buy these things and it's great they're helping us with this," said Maria Lopez, mother of both Joselyn and Ivan. The backpacks were given out Aug. 3 as part of a Back to School event at the school, where parents also took part in workshops on school attendance, helping their children throughout the school year and other school basics. The free gifts came courtesy of nonprofit Rainbow Pack, founded by 13-year-old Riley Gantt. We respect your privacy and do not share our email list.